For some real estate professionals, short sales and foreclosures are the new “traditional” real estate transaction. Knowing how to help sellers maneuver the complexities of short sales as well as help buyers pursue short sale and foreclosure opportunities are not merely good, but critical, skills to have in today’s market. While short sales and foreclosures are not for the faint of heart, agents with the proper tools and training can use these specialty areas to build their business for the long term. As agents can attest, the ability to close short sales and foreclosures depends in part on personal confidence in seeing these transactions through. Designed for real estate professionals at all experience levels, the Short Sales and Foreclosure Resource (SFR®) continuing education and certification course (if desired; see “Certification Approval” below) offers information to direct distressed sellers to finance, tax, and legal professionals; qualify sellers for short sales, develop a short-sale package, negotiate with lenders, tap into buyer demand, safeguard your commission, limit risk, and protect buyers. This course is approved by the Real Estate Buyer Agents Council® (REBAC®) division of the National Association of REALTORS® as a qualifying core course for its Short Sales and Foreclosure Resource (SFR®) certification. If used for certification purposes, students must pay an additional fee, and also must pass an accompanying exam. 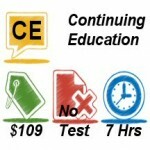 Course State Approval: Continuing education for Pennsylvania real estate broker and salesperson license renewal. This course is a one-day, 7-hour, live classroom course. No post-course exam is given for continuing education purposes. It is approved by, and meets 7 hours of continuing education requirements set by, the Pennsylvania State Real Estate Commission. It can be combined with other courses to fulfill all 14 hours of continuing education required by the Commission for a real estate salesperson’s or broker’s biennial license renewal during the 2016-2018 cycle that ends at midnight on May 31, 2018.